Almost there. The front wheels are on the ground and it looks pretty cool. It might've been more fun to attach all the wheels first before lowering anything to the ground, but no one has that kind of patience, and of course by no one I mean me. Once the front suspension was assembled we had to try it out, so we bolted on the wheels, jacked up the car, and pulled out the jackstands. We held our breath while the jack came down, and didn't exhale until the wheels had fully assumed the load of the chassis and engine. 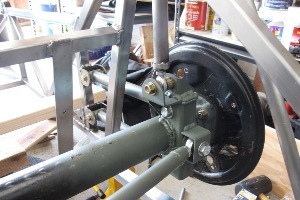 Some friends came over on Saturday and helped install the rear axle. First thing we did was hang our fake steel shocks from the upper shock mounts, then swing them back and tie-wrap them to the W tubes so they'd be out of the way. We then assigned one person to wire-cutter duty, two more to bolt duty, and three to wrestle with the axle. I supervised. Once the axle had been slid into place, wire cutter guy released the shocks, and bolt guys attached the bottom of the shocks to the axle, suspending it in mid-air. And that was it. No dings, no dents, no scuffed paint. In the meantime, the front suspension was drawing a lot of criticism for being out of alignment, everyone in attendance apparently being more than capable of measuring tenths of a degree by eye. So we broke out some wrenches and made some adjustments, and quickly decided that no other car in the history of the world has ever been easier to align than a Locost, although you could probably do a better job of it if you had actual measuring equipment. After everyone left, rebuilding the rear suspension by ourselves was simple and uneventful, if you don't count the one stripped 1/2" bolt that we cross-threaded and eventually destroyed. In our defense the bolt fit easily through the bracket the last time we had the rear suspension together, and we shouldn't have needed to beat on it with a giant steel hammer just to get it though the hole. In any case it wasn't even a real bolt, just something from the hardware store, which explains why the threads crushed so easily. We had better luck with the steering assembly, which went back in pretty much like it had before, once we figured out how it went in before. We knew the steering rack had to go in last, however that kind of information is only useful if you follow it. We installed the rack second-to-last, saving the steering support bearing for last, which of course wouldn't fit because it has to be installed before the steering rack. To be safe, we noted this procedure in our workshop manual, however that's unlikely to do us much good next time around since we're not typically inclined to resort to reading directions. We started assembling the pedal mount, but didn't get very far before we realized we'd missed an excellent opportunity earlier on to weld in a bunch of blind nuts, thereby making it possible to actually bolt the thing together, which it's not, currently. I'm hoping we'll remember to do this next time we have the pedal assembly apart. For now, four bolts is as good as six, or if not as good then at least the bolts are in the holes where they can still act in shear, and as much as it's impossible to reach underneath the structure with a nut, it's equally impossible to look under there to see that the nut is missing. 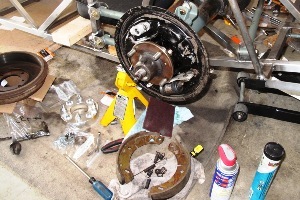 We're currently working on the rear brakes. This would be going much faster if all the parts had been cleaned when we took them off the donor. Somehow we missed that step. But don't worry, we'll investigate this breakdown in protocol and discipline those responsible. Okay, not really. It was probably me. And I'm cleaning the stuff now, so no harm, no foul. Surprisingly, most of the 40-year-old-parts that make up the rear brakes are still operational, and they clean up really well. Exciting days are just ahead. Once the rear hubs are rebuilt we'll officially have a rolling chassis, at least according to our own loose definition of official. With that in mind, it's been slowly dawning on us that we're about to embark on yet another journey into the unknown. 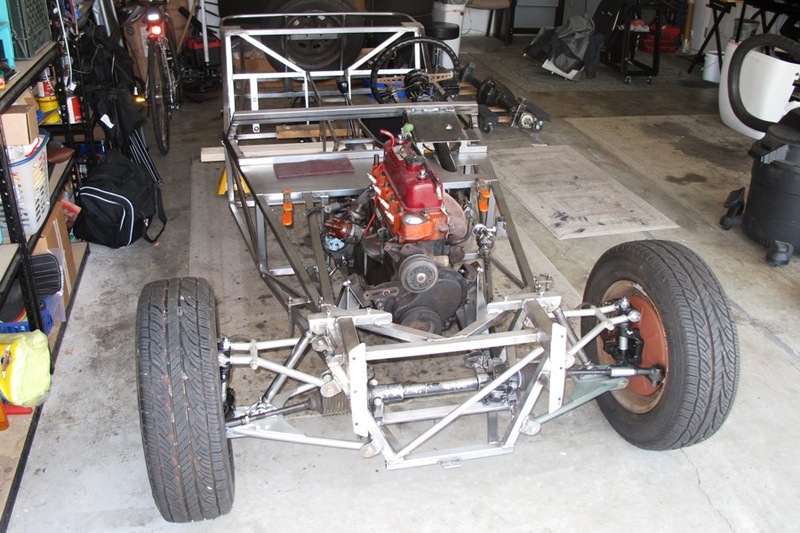 We've long considered the rolling chassis phase to be little more than a photo op, to be followed immediately by a complete dismantling of the car, then final welding and painting. But now with everything bolted on the car, we're not so sure. According to our build plan, we have a few systems yet to install before we can take the car out for its first test drive. We have to plumb the brakes and the fuel system, install the wiring and the exhaust, and get the clutch working. We could wait and do all that after the frame is finished up, and that was the original plan, but we're thinking, maybe we should do it now. What if it turns out we need another bracket? What if, heaven forbid, something doesn't quite fit and we have to make some "corrections" to the frame? In our experience, knowing something is going to work is slightly better than just believing it.